TV on-demand streaming services or subscription video services cost as little as $10 a month. US names include Prime, Stan and Netflix. StreamCo's service is accessed via iOS and Android apps. Android users can then view content on their TV via the Chromecast dongle, while Apple AirPlay enables iOS enthusiasts to stream content to their Apple TV. StreamCo's streaming service costs $10 per month with a 30-day free trial. Join Amazon Prime to watch exclusive Prime Originals as well as popular movies and TV shows. Prime also includes free shipping on eligible items, exclusive access to deals and more. Amazon Prime costs $6.99/month. Until 31 Jan 2019, take advantage of an introductory price of A$4.99/month. Cancel anytime. Available directly through Samsung, Panasonic, LG and Sony smart TVs, Quickflix is also compatible with PS4, Xbox One, PS3, and Xbox 360. 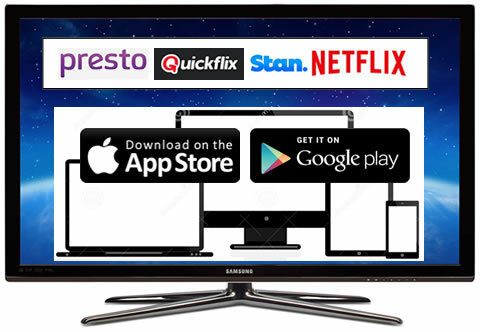 Australia's oldest SVOD service starts at $9.99 with a 14-day free trial. The streaming service can be packaged with a DVD delivery service for $19.99, or the DVD service alone is available for $12.99. Quickflix also has a premium service where purchase new release titles can be purchased individually as pay-per-view. The US heavyweight has not released information on exactly which devices will be compatible at launch, but has stated that the list will include smart TVs, tablets and smartphones, computers and a range of game consoles and set-top boxes. With over 1,000 different internet-connected devices supported in the US, Netflix's connectivity is likely to be more comprehensive than any of its competitors. The Australian Netflix service launched 24th March 2015 with plans from A$8.99 a month with the first month free.